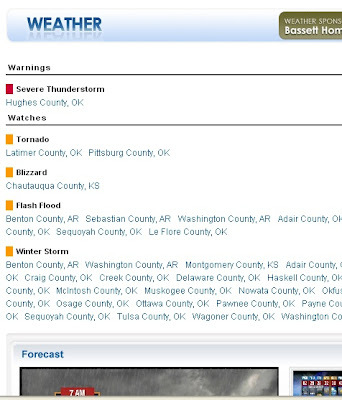 The above image is a screen shot I took from KOTV's website. It shows a Severe Thunderstorm Warning, a tornado watch, a blizzard watch, a flash flood watch, and a winter storm watch ALL IN THE SAME VIEWING AREA!! They tell us to expect up to 6 inches of snow tomorrow, even though right now it is 60 degrees today.